10 mintes walking distance from Keisei Ueno Station. Ueno is just 56 minutes from Narita International Airport by express train. Keisei Sky liner depart from basement of Airport. 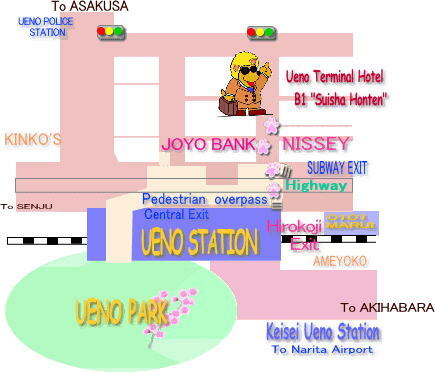 *Narita Int'l Airport Keisei Express Train to Ueno Walk to our Hotel. Click to see what is in the Ueno. World famous Elictric city Akiba is just 5minutes from Ueno.